An old Norman town near Mont St-Michel, home to many medieval manuscripts and great views! Avranches, a town of 8,000 inhabitants, is located on Normandy's Cotentin Peninsula, just 27 kilometers (17 miles) northeast of Mont St-Michel (map). You can actually see Mont St-Michel from Avranches, across the Bay. The two towns are closely connected by history. One of the oldest towns in Normandy, St Aubert was the Bishop of Avranches in the 8th century. Legend has it that St-Michel appeared to the Bishop twice, telling him to build a church on the present day location of Mont St-Michel. Losing patience when he had to ask a second time, St-Michel purportedly poked a hole in St Aubert's skull. 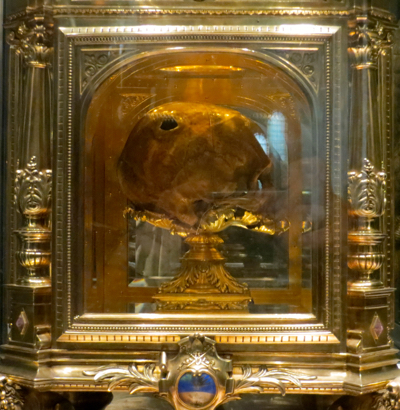 Today, in the Basilica of St-Gervais-et-St-Protais in Avranches, you can see an ornate reliquary that does indeed contain a skull with a hole in it. with the hole made by the finger of St-Michel? You can also enjoy lovely views of Mont St-Michel, particularly from the Plate-forme, a small square near the Scriptorial. For more information about the Baie of Mont St-Michel, you might consider a side trip to the Ecomusée de la Baie du Mont St-Michel. This museum, housed in an old farm and surrounded by apple trees, is reached by car down some narrow roads and through tiny villages on the Pointe du Grouin du Sud (map). Although it's less than 10 kilometers from Avranches, getting there can be an adventure. As you continue along the road, you'll come to parking areas where you can leave your car and walk along the shore, enjoying the views of the bay and Mont St-Michel in the distance. It's a great spot for a picnic or relaxing stroll after a busy day sight seeing. 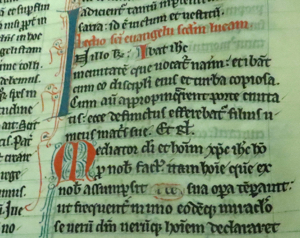 Above, Detail from 13th century psalter and breviary used at Mont St-Michel. 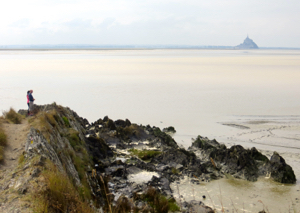 Below, View across the Bay of Mont St-Michel, from near the Ecomusée.